Today was the Federal Veterans Day holiday as well as the grand opening of Lemonade at The Promenade at Westlake (at the former home of CPK ASAP). I just happened to be in the neighborhood so I was one of the lucky ones to try this brand new restaurant out! This is the 10th Lemonade location, so they must be doing something right! I stepped inside the completely redesigned restaurant and was impressed by the visually appealing new stainless steel, white, gold and yellow toned theme. I arrived during the noon lunch hour and it quickly was buzzing and bustling. Kind of noisy in fact, but it was kind of fun. They retained the outdoor patio area and many took advantage of it. I'm a pretty lean guy (and in fact I ran a full marathon yesterday) and I noticed the chairs seemed somewhat narrow, even for my skinny rear. Curious to hear others' observations about that. 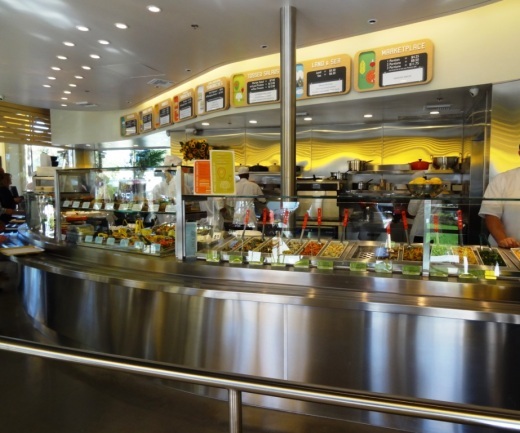 Lemonade bills itself as fast-casual cafeteria style cafe serving up a diverse range of fresh, high-quality and innovative foods. Now that I've eaten there and seen what they have to offer, I agree with this description. The food was very fresh tasting and quite interesting. 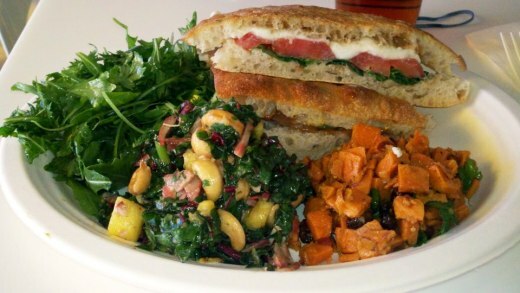 I tried the caprese sandwich and several of their "Marketplace" items, including diced sweet potato with pistachios and a "Char siu" chicken dish with pineapple, cashews and other interesting, healthy ingredients. Your first visit to Lemonade may be somewhat confusing as they have such a diverse array of choices. It truly is cafeteria style, where you can choose from at least a dozen Marketplace items, all of which looked really good, "Land & Sea" items like salmon, chicken and seared ahi tuna, tossed salads, sandwiches, fresh soups served with grilled rustic grain bread and really tempting array of desserts, including cupcakes (only $1 for a mini cupcake! ), brownies/bars, cookies and macaroons. Basically you order, pay, take a number and they bring your food to you. For some reason that didn't happen with me...I sat there at a table with my iced tea and a number and they called it out for me to retrieve. But 30 minutes later my friend received his chicken sandwich order at his table. That was the only "glitch" of my first experience. I get a good feeling about this place. I like it. I think you will too. The pricing is not "cheap" but for the quality I think it is fair. To me this is a great place for a group of 4 to share a variety of items, particularly the Marketplace choices. Visit lemonadela.com for more information or call 805.778.9100 for more information. I noticed the sign on the door indicates their hours are 11 a.m. to 9:05 p.m. The Promenade at Westlake is located at the southeast corner of Thousand Oaks and Westlake Boulevards.